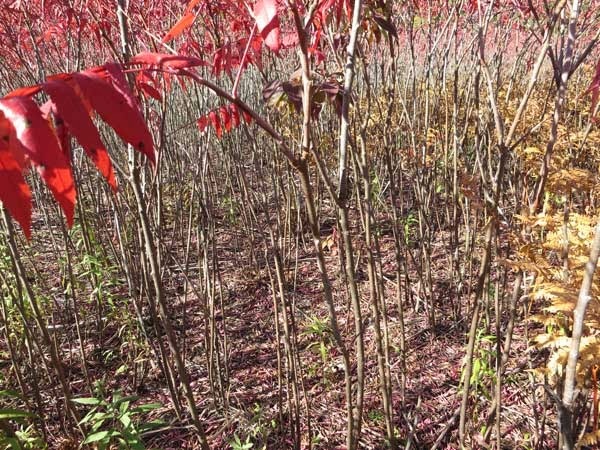 I have made a number of earlier posts on sumac eradication (summarized in sumac biology and control,) but one area I have not discussed is allelopathy. The photo below shows part of a clone which had moved into what was once a well established prairie. The ground is completely bare, even though some sunlight is obviously available. 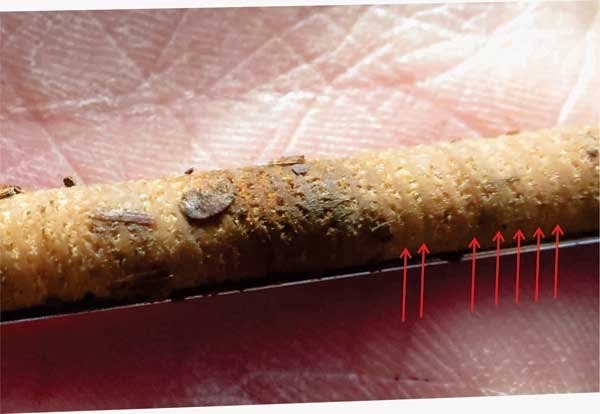 It seems likely that there is some chemical explanation for this "sterile" soil surface. There are a few published papers on sumac allelopathy. The most extensive work was done by Petranka and McPherson in Oklahoma with Rhus copallina (Ecology, 60: 956-965; 1979). A Google search using the search terms "Rhus" and "allelopathy" will bring up more papers, including a number published (in English) in China. The toxins involved are supposed to be tannins, although detailed chemistry has apparently not been done. From an ecological point of view, the chemistry and plant physiology are not too critical. What is important is how long the substance remains active in the soil. My experience is that a former dense sumac clone will be colonized with some native species within a year, and with careful restoration work native prairie will be recovered within two years at most. Sumac is a really bad invader. Once it takes a hold of an area, it is a four to five year job to get rid of it. See this post for details. How much does it cost to do a prescribed burn? For the past dozen years I have been writing narratives of each of our prescribed burns, with records of personnel, timing, procedures, etc. These narratives go in the Pleasant Valley Conservancy files, where I can access them any time. With GIS I have been able to determine accurately the acreage of each burn unit. In the early years, our burns were fairly small, but as restoration proceeded we were able to burn larger acreages. Although some of my notes are sketchy, they are detailed enough for the present purposes. I broke the burn work down into various tasks, recorded the number of people involved with each task, and the number of hours. The total hours is only that expended on the day of the burn. Thus, preparation of fire breaks is not included. Also, fuel cost is not included in this analysis but could be. The final value is total person hours per burn. An example of a typical record is given here. Preparations, which included final touch-up of the fire breaks, assemble equipment, water, drip torch fuel, etc. took 4 people, 2.5 hours, or 10 person hours. Orientation: maps are passed out, the burn boss explains the burn, radios are distributed, tasks are assigned. 12 people, 0.5 hours, 6 person hours. The burn itself: 12 people, 3 hours, 36 person hours. Major mop-up: 12 people, 1 hour, 12 person hours. 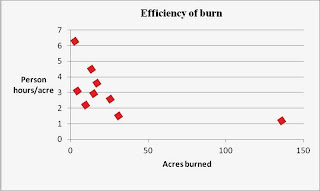 The graph below shows a summary of the burns we did in 2013, plotting person hours per acre versus acres burned. 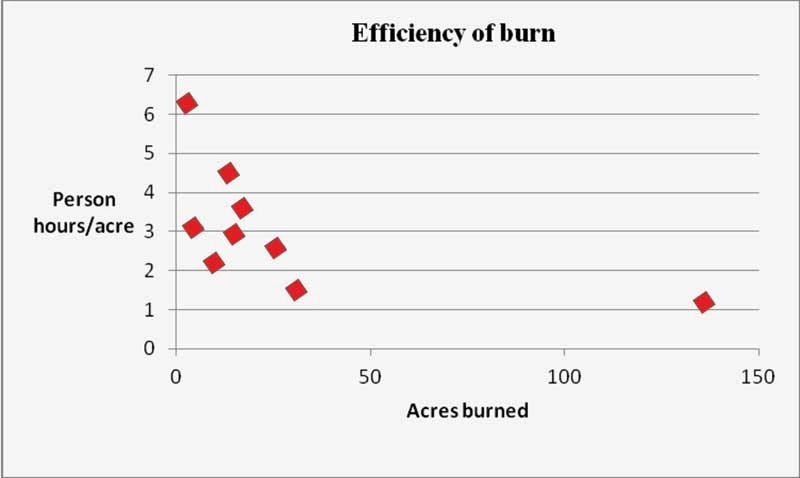 This is a very interesting graph, as it shows that lots fewer person hours per acre are needed for large burns than for small ones. Plug in the hourly wages you are paying your workers and you can calculate the cost of a burn in real money. For the example here, the total cost is $2040 (assuming labor at $30 per hour) or $78 per acre. The most costly burn in the above graph was not the 140 acre burn but the 3 acre burn we did of the Crane Prairie, which took 6.3 person hours. Data such as this provide quantitative support for State Natural Areas biologist Matt Zine, who several years ago gave a nice paper promoting the value of doing large burns. There are lots of other reasons for doing large burns in addition to cost, but that will be the topic of another post. Now that seed collecting is over, work turns to brush control. November is an ideal time, since all the living vegetation has senesced and the ground is still snowless. Our focus is mainly on the North Woods, which unfortunately needs a lot of work. When we began restoration work in the early 1990s, we focused on the high quality areas of the Conservancy, such as the prairie and savanna remnants. Clearing, burning, and overseeding were the principal tasks, and the habitat responded in dramatic fashion. The north woods is primarily an oak woodland. Most of the oaks are Quercus rubra, with scattered white, bur, black, and Hill's oaks. A few large walnuts still remain, and there are scattered areas of birch. Analysis of the 1937 air photo showed that most of the north side was unlogged, although there were a few logged areas at the east end, as well as near the quarry road on the west side. Follow this link to the 1937 air photo on our web site. Through the years we have done some restoration work in the north woods when time permitted. Most of our work was on the road cut along County F, because that was an excellent seed source for our savanna restoration work. However in January 2006 we hired a six-person crew to basal bark all the undesirable shrubs in this 25 acre site, principally buckthorn and honeysuckle. Although this was fairly successful, some areas were inevitably missed, and we did not have enough time to tackle the inevitable resprouts. We used a LIP grant in 2011 to work on a major area of buckthorn in the NE corner of the site that the 2006 crew had not tackled. This area was seen as cleared in the 1937 air photo, and was thus an ideal area for establishment of invasive brush. In 2013-2014 our focus is on a rather large buckthorn area at the top of the hill. Understandably, the invasive brush is best established around the edges of the woods. Our access here is from the North Fire Break, which Kathie has been keeping open all summer with the Kubota tractor. The Kawasaki Mules are ideal for getting into the site with brush cutters and chain saws. Many of the larger buckthorn are dead, the result of the 2006 work, but there are lots of smaller ones. Also, the site we are working in is on dolomite and there an entrance to at least one cave, which of course attracts woodchucks, etc. 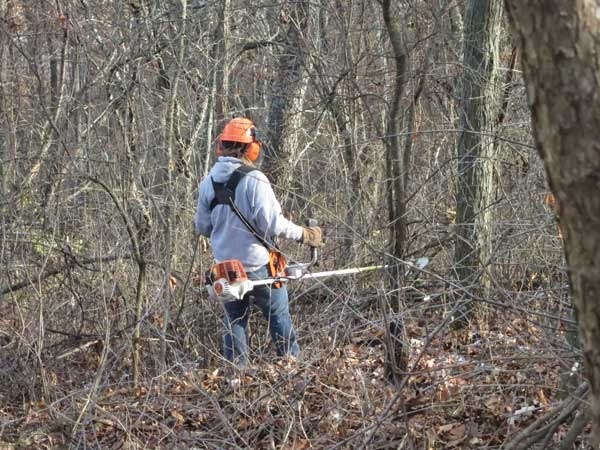 Between the animals and the birds, a lot of invasive shrubs get established. (There is even a smallish patch of garlic mustard!). Work here is at least a two-person job, one cutting, the other building brush piles and treating. Cutting buckthorn. The photo does not show how steep the terrain is here. We are hoping for a light snow year so that we can work all winter! 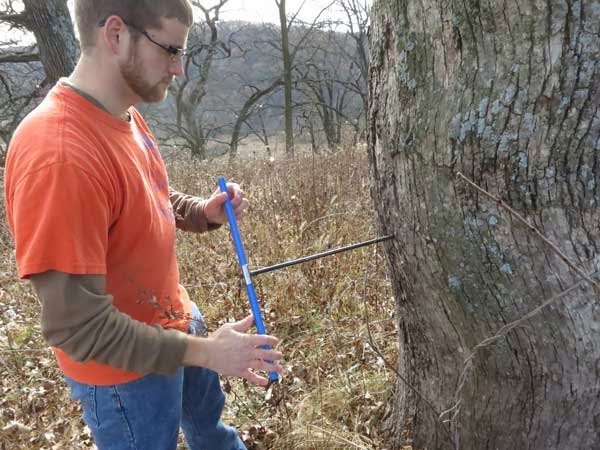 We are cooperating with the Tree-Ring, Earth, and Environmental Sciences Laboratory (TREES) of the University of Wisconsin-Platteville on their study on drought and climate change over the past 300 years in Wisconsin's Driftless Area. This project, under the direction of Professor Evan Larson and Chris Underwood of the UWP Geography Department, is funded by a grant from the U.S. Geological Survey and the UW Aquatic Sciences Center. Sara Allen is managing the project as a post-bachelor research fellow. Yesterday the tree ring team cored a number of large bur and white oaks at Pleasant Valley Conservancy. These were mostly larger savanna trees along the ridge top. 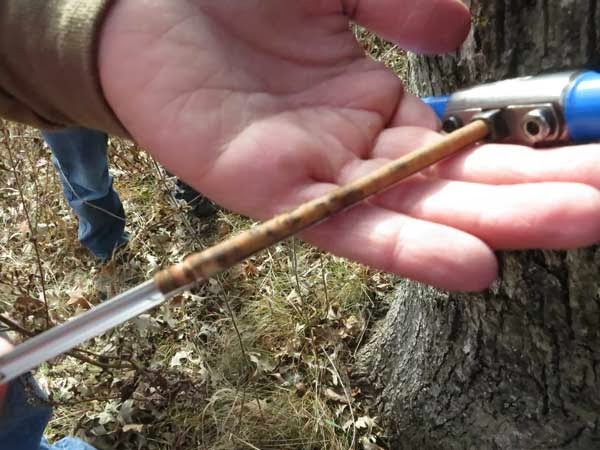 The coring device is a precision increment borer 0.20" in diameter, with a sharp, steel, cutting end that penetrates the tree. The tube is fixed to a handle which provides leverage for the coring process. Steve coring a fairly elderly bur oak on the ridge top in Unit 8. Once the cutting edge reaches the center of the tree, the core is broken, an extractor inserted, and the core carefully removed from the tree. The photo below shows the core as it is being removed from the tree. The core being extracted. The extractor is a curved metal strip. At this stage the tree rings are not very well defined so I have added arrows to give an idea of the distribution of rings. The arrows show a few of the rings. The palm of the hand provides the scale. To protect the core, it is inserted into a long straw, and both ends sealed. In the laboratory the core is mounted on a wooden holder and sanded flat so that the tree rings stand out. Analysis is done under a dissecting microscope. Prairie dropseed (Sporobolus heterolepis) is a highly desirable grass (C value of 10), that is often included in prairie plantings but can also be found in the native state. According to Cochrane and Iltis it is a tussock grass par excellence and is an indicator of unplowed and relictual dry prairies. Now is an ideal time to seek out prairie dropseed because most of the native vegetation has senesced and turned brown. 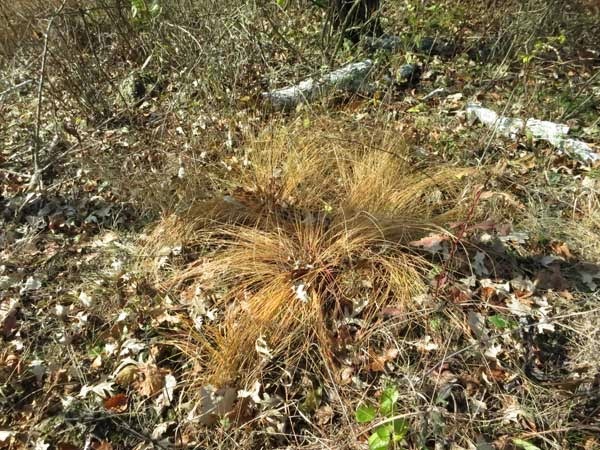 This makes the characteristic dropseed tussock readily seen, especially since its graceful form and rich color make it stand out. At Pleasant Valley Conservancy we have several sites where dropseed was present before restoration work began. The two goat prairies (Units 1 and 4) were the best, and Kathie collected lots of seeds from Unit 1 the year after our first burn. In addition, we find dropseed growing well on several of the dolomite rock outcroppings. Although they don't seem to spread away from these habitats, they are quite long-lived at these sites. The best places to see these plants are on the outcroppings we call the Rocky Overlook (above Unit 6) and the East Overlook (above Unit 7). The latter is easiest to find as a trail leads right to it. Because of the hard rock formations at these sites, it seems unlikely that the plants are very deep-rooted. Note that these plants are native to their sites and were present before we started restoration in 1998. Mullein (Verbascum thapsus) is a biennial invasive weed in the figwort family. The first year it is a low-growing rosette and the second year it sends up a tall, ugly, flower stalk which produces lots of seeds. Although it does not compete well, it gets established well in bare areas such as generally exist in early prairie plantings. Although mullein is frequently used as a herbal, it is definitely undesirable in any natural area and should be eradicated. Yesterday Kathie and I ran across a large patch of mullein in one of our open savannas (Unit 11A). It seemed a little strange, since the area had been a large patch of colorful bergamot in mid-summer. However, the bergamot seed heads were still present but the foliage had senesced and the soil was bare, ideal conditions for mullein to get established. Although it is possible that next year the mullein will be out-competed, we weren't taking any chances, especially since conditions were now ideal for the Garlon spritz technique. Within fifteen minutes we had finished the job. For this work we used 20% Garlon 4 in bark oil, with an oil-soluble red dye as a tracer. Note that the whole plant does not have to be sprayed, only the center of the rosette. It takes about 10 seconds per plant. You won't see much of a response this time of year, but the roots will be killed as soon as growth starts next spring. 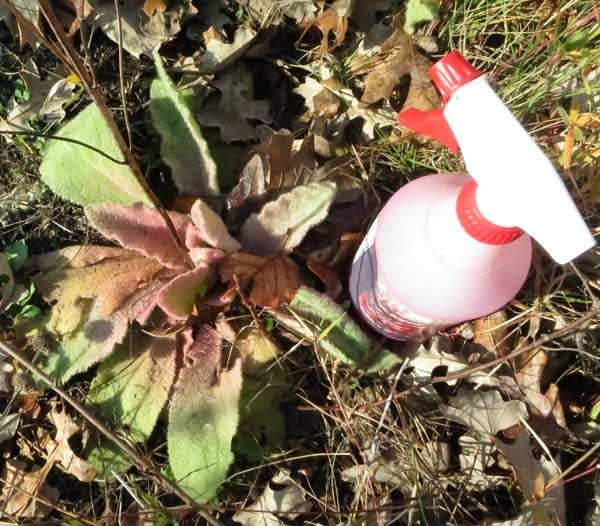 Hand spray bottle next to sprayed mullein rosette. Only the center needs to be sprayed. Most people control mullein by digging the plant up. This may be necessary for tall second-year plants, but herbicide is ideal for first year plants. At the same time we were doing this mullein patch we basal barked scattered buckthorn and other woody invasives. One of the great advantages of the Garlon spritz technique is that the same mixture also works for basal bark of woodies. After a series of rainy days a high pressure came in, leading to a sunny and warm Sunday afternoon. Kathie, Emily, and I took the Mule to the top of the ridge and enjoyed a walk through the bur oak savanna. The photo shows the top of the gully and the area just below the South Fire Break. 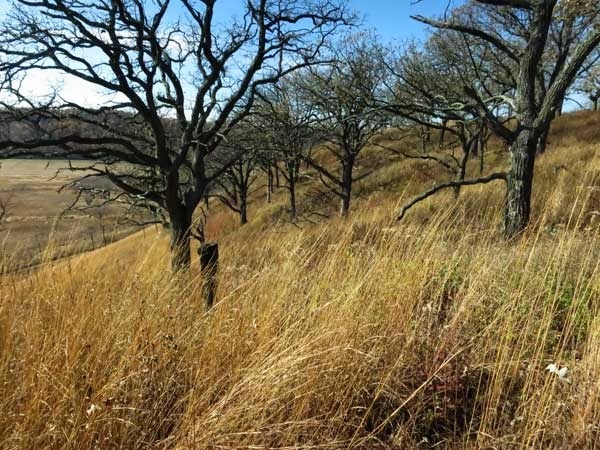 November 2013: The ridge-top bur oak savanna just below the South Fire Break. Handsome trees and well established Indian grass. The savanna is now open enough so that Indian grass (Sorghastrum nutans) has become well established. 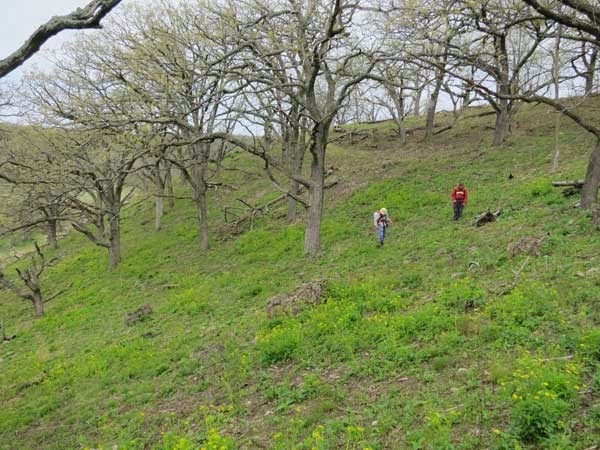 When we first started restoration work in 1998 the area between the trees was a buckthorn thicket and only the lower part of the hillside had any prairie plant components. 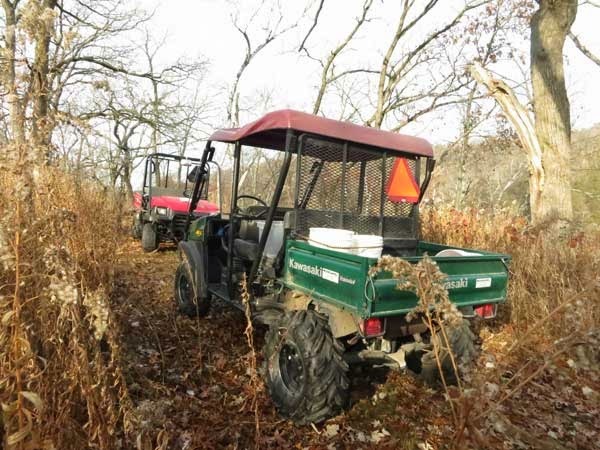 Removal of buckthorn and other brush followed by burns started the restoration process but it took over 10 years for the Indian grass and prairie forbs to become well established. Due to the increased light, brambles moved in and had to be dealt with. Even now (see photo below), in the late spring woody vegetation resprouts must be herbicided. 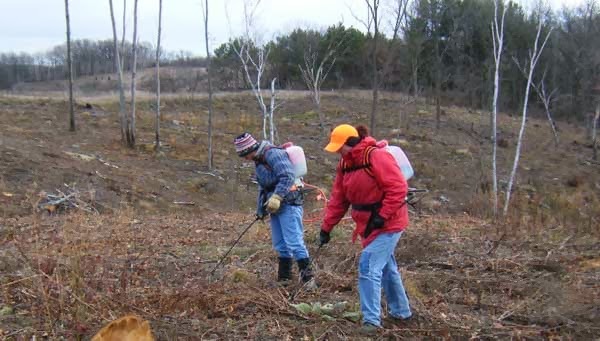 April 2012: Susan and Amanda seeking out and destroying undesirable herbaceous and woody vegetation. It was at least 10 years before this area carried a fire well. Now it burns almost too well and we have to backburn it down from the South Fire Break.